Effective immediately, Air Force officials have removed the requirement to complete Courses 14 and 15 for all Airmen serving in the active component. Air National Guard and Air Force Reserve Airmen will have the option to complete their enlisted professional military education through distance learning or in-residence attendance. Airmen will no longer be required to complete distance learning prior to in-residence attendance at the noncommissioned officer and senior NCO academy. 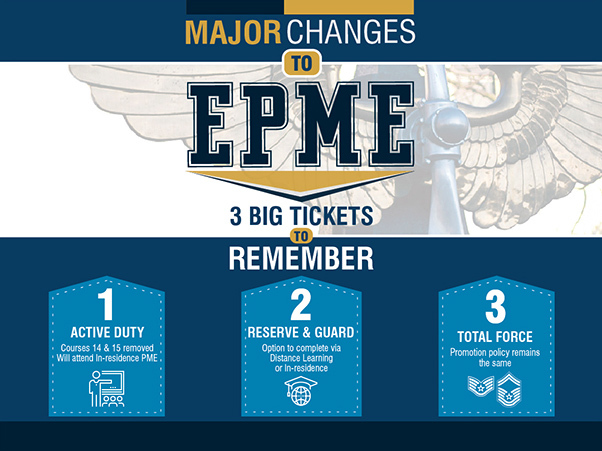 Active component Airmen will complete EPME in-residence, while Guard and Reserve Airmen can complete through DL or in-residence. All active component Airmen currently enrolled in Courses 14 or 15 may continue the course or disenroll. Guard and Reserve Airmen currently enrolled are encouraged to complete the course unless they are currently scheduled to attend in-residence. 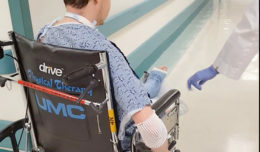 The decision was based on feedback from the 2017 Enlisted Professional Military Education Triennial Review Committee, EPME working groups, and EPME students and instructors. The 2018 National Defense Strategy calls on all services to evolve their PME, emphasizing intellectual leadership and military professionalism in the art and science of warfighting, deepening our knowledge of history while embracing new technology and techniques to counter competitors. If Airmen choose to remain enrolled and complete the course, completion will be reflected in their personnel records along with the appropriate Community College of the Air Force credits awarded. Additionally, the enlisted promotion policy remains the same and is not affected by this revision. For more information, visit http://www.afpc.af.mil/Support/myPers/.